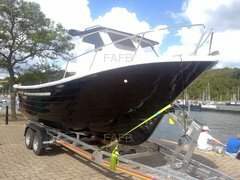 Vessel come with own trailer which has had new bearings installed and well looked after. Weight is 5 ton and can be towed with tractor. Easy to put on trailer and well balanced for towing. New ZF gear box ($3,800) installed with 20 Hours run in this Sept 2018. New Jabsco Toilet with fresh water system with shower inside and out side. Inside cabin can sleep 4 adults or a combo of 2 adults and 4 kids. Table can be installed in side the cabin or on back deck. 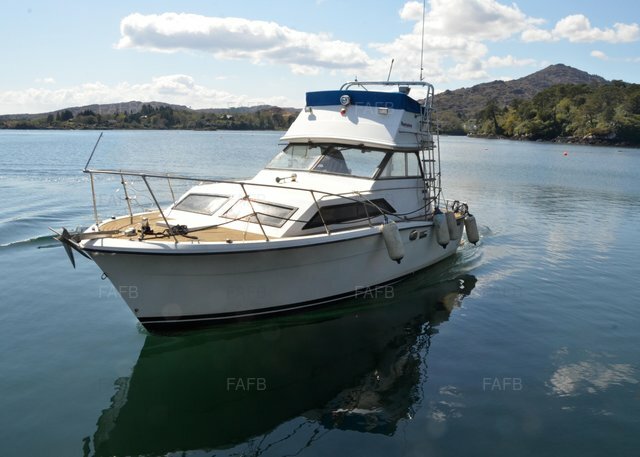 VESSEL HAS A FLY BRIDGE WITH FULL CONTROLS STEERING AND THROTTLE AND TRIM TABS WITH VHF AND CONNECTION FOR PLOTTER, ROOM FOR 2 ADULTS AND 2 KIDS WITH PLENTY OF STORAGE FOR WET SUITS AND LIFE JACKETS. LADDER INSTALLED ON PORT SIDE TO FLY BRIDGE.